The pomegranate is a red fruit approximately the size of a softball. This tasty and healthful fruit is native to the Mideast. But gardeners in southern areas of the United States can grow pomegranates outside and gardeners living further north can grow pomegranates in containers. Pomegranate trees prefer warm, dry weather conditions with hot summers and cool winters. Eating and serving a pomegranate might be intimidating at first, but with practice, it becomes quite simple. 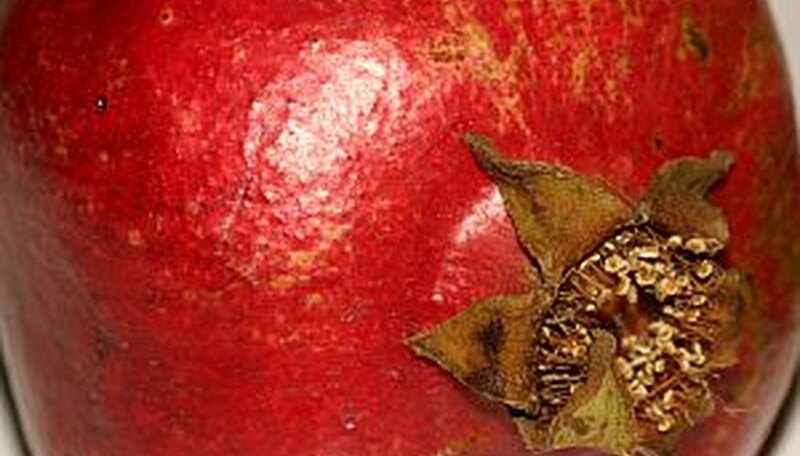 The red seeds and surrounding red membranes of the pomegranate are edible. You must separate the seeds and membranes from the outer white portions of the fruit. Store whole pomegranates at room temperature or in the refrigerator and refrigerate or freeze the seeds. Keep whole pomegranates at room temperature for up to two weeks. Place the pomegranates in a bowl or on a decorative tray in a spot on the counter away from direct sunlight. Place whole pomegranates in the produce crisper drawer of the refrigerator for at least one month (and possibly longer). Cut open the pomegranate and separate the seeds from the outer white portion of the fruit. Place the seeds in a sealed plastic bag and place the bag in the crisper drawer of the refrigerator. Use the seeds within three days. Remove the seeds from the pomegranate. Line a baking sheet with parchment paper and spread the seeds in a single layer on the parchment paper. Freeze the seeds on the baking sheet for approximately two hours. Remove the baking sheet from the freezer and place the frozen seeds in a plastic freezer bag. Seal the bag and freeze the seeds for up to one year. Pomegranate juice stains surfaces and clothing. Wear an apron while cutting and seeding pomegranates to avoid staining your clothing.